taken place in 2018 but was cancelled due to the ‘Beast from the East’ (part 2? ), which worked out quite nicely for me as I’d entered last year’s event but had pulled out fairly late on due to injury with the organisers deferring my place to this year’s race. I travelled down to Weston Super Mare on the Friday accompanied by my cheering squad consisting of my sister, Tammy, niece and nephew, Mia and George, stopping in a hotel l ess than five minutes walk from the start and finish lines. 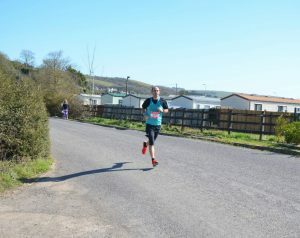 Sunday morning saw Weston basking in glorious spring sunshine with a gentle sea breeze, perfect conditions for running. After meeting up with fellow Harriers Emma and Dave for a quick chat and a team photo, I headed off for a short warm up before heading to the start line on Marine Parade, ready for the off. The route headed south, a quick wave to the cheering squad before passing the old Tropicana on our right hand side (anyone else remember their giant pineapple slide? ), before turning left onto Beach Road, heading back towards the start, giving another wave to the cheering squad before turning left again and heading down Marine Parade for a second time. A large portion of miles 2 to 3 was run on the beach, with the tide going out to our right and Weston Super Mare golf club to our left. It was noticeable how everyone’s pace dropped slightly on the sand, despite it still being fairly firm underfoot. We turned left at the end of the beach and the next 5 miles or so headed along a mixture of A roads, country lanes and parkways including a few short uphill sections (shorter stride, drive with the arms. Thanks coaching team!) before dropping back down by Uphill Marine centre and returning back onto the beach for a second time, heading back towards Weston sea front. Miles 8 to 10ish were nice and flat, passing the start line and the Grand Pier (and the cheering squad again – sorry for the rather sweaty high fives! ), continuing past the Marine lake, passing the old and now dilapidated Birnbeck Pier before heading uphill (who knew Weston had so many hills? ), steadily climbing towards Kewstoke with some fantastic views across the Severn Estuary with the coast of Wales off in the distance. There was now a dead turn (I genuinely practice those especially for days like this. It was textbook! ), heading back down along the way we came, spotting Dave and then Emma heading up the hill in the opposite direction, back along the sea front before turning right onto the Grand Pier for a sprint finish,encouraged by the cheering squad once again, finishing just before the Pavilion. Luckily, the pier owners were feeling generous and decided against charging everyone their usual £1 entry fee. Finishing with a chip time of 1:35:09, nowhere near a PB but a time I was more than happy with after last year’s injuries. All in all, it was a thoroughly enjoyable event although looking at some of my race photos, that enjoyment clearly didn’t show on my face! Well organised with some great scenery and good crowds along the route, the only disappointment being the lack of a stick of rock included with the finishers medal and t-shirt.